It helps to have good suggestions, advice and tips when selecting your bathroom tile designs. Especially if this is your first attempt at bathroom renovations or designing a new bath, advice from tiling professionals is highly recommended. 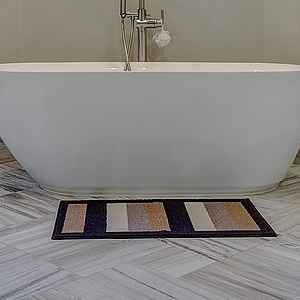 Friends and neighbors who are more experienced at refurbishing baths or choosing new bathroom decor than you may be can also offer essential tips for making ideal tile design selections. • Porcelain or Ceramic Tiles. – If you want artistically patterned and beautifully glazed tiles in different shapes or sizes to embellish your bathroom decor, these tiles may be your best choice. Formed from clay mixtures that were pressed and kiln-fired at high heat settings, these tiles are durable and very practical as well as creative and appealing. If you like, you can have an artisan secure your favorite digital images with high resolution on these tile surfaces before the glazing process. • Glass Tiles. – The luster and sheer elegance of these tiles plus their wide range of colors make them quite attractive and popular today. When placed on your bathroom walls in brilliantly hued, decorative designs or as mosaics on the floor, they create a stunning creative display. However, these tiles should not be placed on sections of bath flooring that is highly trafficked to avoid wear-and-tear or damage. Glass tiling of this type is waterproof, which is a definite advantage for bathroom decor. • Stone Tiles. – Tiles made of natural stone have rough surfaces and imperfect shapes, which gives them a unique and rugged charm. Oddly enough, these tiles are attractive decor for both vintage and ultra-modern bathroom interiors. However, to give theses tiles watertight surfaces, you must have them coated with a membrane that is waterproof. was heated for centuries by the earth, this lovely stone has been used as a decorative feature since ancient times. • Travertine Tiles. – This variety of limestone is usually a deposit in warm or hot springs. Its surface has a fiber-like appearance and is popular for use for bathroom walling and flooring material in color choices of rust, tan, cream, and white. This stone is very durable yet attractive and is often used in bath interior design. To ensure making the very best bathroom tiling selection for your new bath decor, consult the experts at Concept Bathrooms in Preston, Victoria today. These tiling professionals will offer you quality tiles and excellent tips for achieving the most creative and practical bathroom design imaginable.